Lantek Flex3d 5x automatically generates the fixtures necessary for positioning the part correctly on the machine table. Taking as a base the desired position and height of the part above the cutting table, the system provides a user-modifiable holding grid, where the user can decide how many fixtures will hold the part in place and their locations. When the appropriate holding grid has been designed, Lantek Flex3d 5x generates the solids necessary for positioning the part on the table. Automatic fixture calculation takes cutting contours into account, so that the calculated fixtures do not interfere with either the cutting head or any of the holes to be cut. This saves valuable machine time, normally associated with program verification in the machine. Lantek Flex3d 5x automatically detects all the part cutting contours, allowing automatic or semi-automatic machining of these contours. The qualities to be applied to each contour can also be selected by user. The automatic machining sequences and model intelligence is generated irrespective of where the 3D CAD design data originated. As a result, Lantek Flex3d 5x enables manufacturing of products directly from design data, eliminating potential errors. After machining, the system allows entire work environment simulation. The software and post-processors include a three dimensional model of the appropriate machine and cutting head. Lantek Flex3d 5x automatically detects any possible collisions of the head with any other elements involved in the cutting operation, offering multiple possibilities for correcting them. The physical limits of the axis are also considered during the whole process. Lantek Flex3d 5x permits full cutting direction change. Any cutting vector can be modified, erased or inserted at any point of the contour so it prevents unwanted movements and positions. 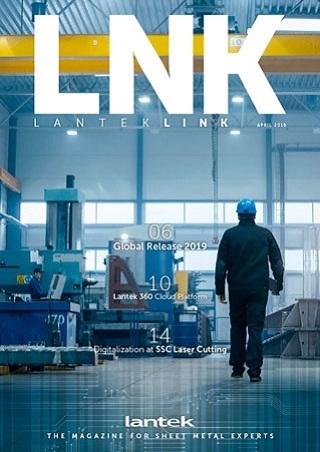 Lantek Flex3d 5x is able to simulate in 3D the cutting sequence of any 5x machine, providing a powerful tool to avoid undesired behaviors in the real operation.